Build an underground greenhouse for year-round gardening. If you’re living a more natural life style, you likely put in a lot of time and effort to grow a good portion of your own food. Undoubtedly, your gardening activities are very much determined by the weather you experience. If you also live in a region that enjoys cold weather from Fall to late Spring, you’ve likely gone through Winter and Spring anxiously awaiting the last frost and warmer weather so you could get plants and seeds in the ground and have them survive while you take advantage of whatever length growing season you have. It’s times like that when you yearn for the warmer weather of more southern regions. Perhaps, you’ve seen greenhouses on other properties in your vicinity and wished that you had a greenhouse so you could get your planting started much earlier. We’ve done it. Wistfully looking at a greenhouse that is misted from the condensation while knowing that they’ve already got plants growing even though the ground is still frozen! While one is standing there looking at one’s own garden that is still cold, hard and lifeless, it can be quite a motivator to think about how to get your garden started earlier. If the growing force is strong with you, you know what I’m talking about. Well, this article from Treehugger.com about how to build a walipini or underground greenhouse may point a way that would work well for you. 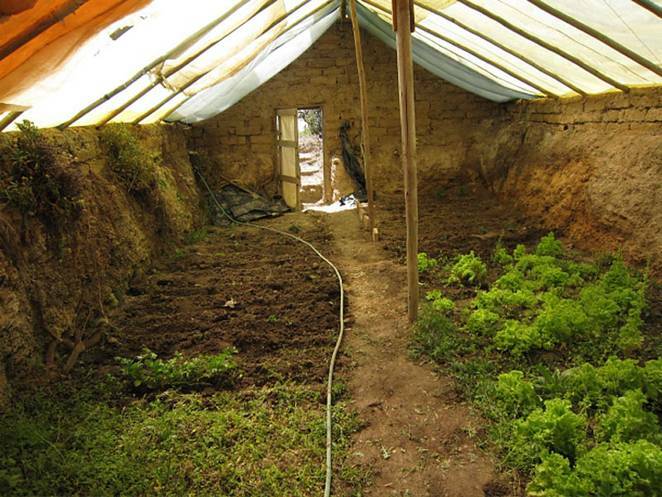 If you have some land and are willing to put in some work, you can build your own underground greenhouse for not a lot of cash. Not only that, this style greenhouse can help you save money as it doesn’t cost as much to maintain warmth during colder weather. In fact, you may find you need to shade the little sun you get as it definitely stays warm.